Portable clear board on a roll that sticks with static cling to any hard, flat surface. Write on Magic clear board with dry erase markers. Erase and rewrite as many times as you want. Ideal for writing on glass walls, maps and blueprints. 25 perforated dry erase sheets on a 65 ft. long roll. Each perforated sheet measures 23.5? x 31.5? No glue or residue to leave behind. Place, write, erase, move, re-use totally transparent! View More In Dry Erase Sheets. If you have any questions about this product by Magic Whiteboard Products, contact us by completing and submitting the form below. If you are looking for a specif part number, please include it with your message. 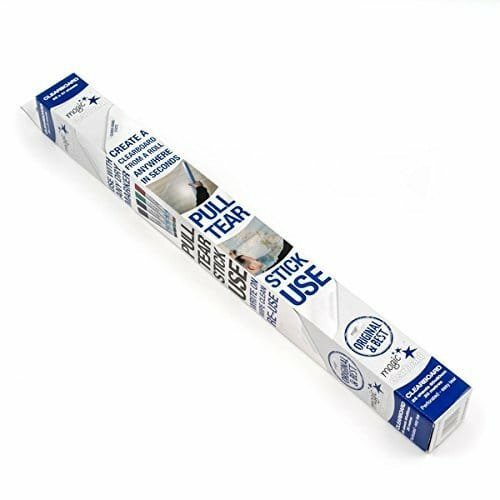 12" x 24" Dry Erase Whiteboard Sheet with Adhesive on Back - Magnetic Receptive.